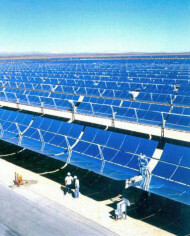 For the last decade Spain has lead the World in the development of concentrating solar power (CSP). The debt crisis has hit Spain hard, and cutbacks do need to be made, but sadly they are now ‘throwing the baby out with the bath water’. On 1st February 2013 a Royal Decree was passed which will slash tariffs for solar electricity which coupled with other policy changes will decimate this most useful of industries within Spain. At the same time several other countries are now realising the potential of CSP for their economies. Much media focus is on the giant economies of USA, India and China. I however want to focus on a group of smaller economies where concentrating solar is beginning to take off, and where it will probably play a much greater role in terms of their energy mix than in the three giant economies. These countries are a pretty diverse group, and in some cases might be considered outside contenders to be at the forefront of a new industrial revolution. They include Morocco, Chile, Australia, South Africa, Saudi Arabia, Abu Dhabi, Qatar, Jordan and Israel. All these countries have plenty of sunshine making them ideal for this technology. However the political climate is also of significance. Mariano Rajoy’s election in December 2011 was bad news for CSP in Spain, just as Julia Gillard’s election in Australia 2010 was good news for Australia’s solar industry. Overcoming political instability is a prerequisite for Egypt and Tunisia to join this group. My last blog was about a totally amazing project in Qatar. Over the next couple of months I’ll write blogs about some exciting developments happening in the rest of this group. The basic technology has been known about since Auguste Mouchout’s pioneering work in the 1860’s. However it has sadly taken a long time for it to be developed, historically due largely to abundant and cheap fossil fuels. Now at last this most useful technology is beginning to take off. In 2006 there was less than 0.4 GW of installed capacity globally, by mid 2012 this had increased to 2GW and by 2015 10GW is predicted to be up and running. This entry was posted in Business Investment, Energy, Global, Politics on 25 February 2013 by Richard.